Summertime means its time to party. Everyone loves to let their hair down and to get frisky and wild, but some places like it just a little more. With the world filled with options to party it’s only you that is holding yourself back from booking a ticket and joining parties that have reached the status of legendary. 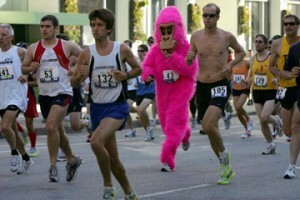 What: Began as a 7 mile long foot race Bay to Breakers has turned into a 7 mile costume party and keg race instead. Traversing through down town San Fran people come dressed in wildly elaborate costumes and push along with them kegs of beer in shopping carts, the result is a mixture of Mardi Gras and Halloween with a spring break’esque’ twist. What: Holi is a Hindu festival that occurs in northern India where people look to renew themselves for the next year coming. This renewal process starts with a bonfire than eventually descends into splashing water and coloured flour all over everybody. Chances are everyone wouldn`t mind if you add a little firepower to the proceedings and drink before the flouring begins. What to Bring: Different colours of flour, plenty of water and clothes that can get trashed. What: Started as a street party that gave the chance for local shops to give back to the community by giving music and good cheer on the streets in front of them. Eventually shops started competing to have the best parties and now its just a huge bash that take place for four days around Copenhagen. Each day street parties, complete with plenty of street drinking, take place in a new part of the city. Wild great time are assured. What to bring: Bring yourself, good cheer, and beers for in your backpack.